What could be better than playing in a Chocolate Factory? Click here to play! Winning lots of money in a Chocolate Factory, naturally! Join Mikey and his sister Candy as they run amok in Doctor Chocolate's experimental Chocolate Factory, where the delights of yesterday are revamped for today. Chocolate coins are scattered all about, so be careful not to step on them. Turkish Delights and Praline Shells are some of this Chocolate Factory's specialties. Mint Wedges, Cherry Creams and chocolate coated Hazelnut are its premium creations, however, and they are worth a pretty penny to people outside Doctor Chocolate's Chocolate Factory. Play with the Master Chocolatiers or in the Dunk-A-Treat vat for a special surprise. Find Doctor Chocolate's amazing experimental bonbons to have the chocolate experience of a lifetime. There is so much to do in the Chocolate Factory, so give yourself a treat and start playing today. The Master Chocolatier symbol is a scatter symbol that pays out on the total bet when 2 or more land on the reels. 2 symbols pay 3 times the bet, 3 pay 10 times the bet, 4 pay 25 times the bet, and 5 symbols pay 200 times the total bet. The Doctor Chocolate symbol is wild, substituting for any chocolate symbol. There are two bonus games. The Bonbon Box Bonus is triggered when 3 or more Bonbon Box Bonus symbols land on an active payline. 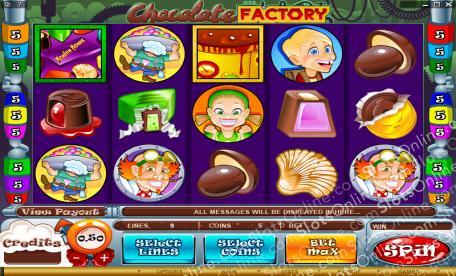 In this bonus, the player must choose a number of chocolate boxes, each one revealing a bonus prize amount. Boxes are chosen until a box reveals 'Collect' instead of a prize amount. The Dunk-A-Treat Bonus is triggered when 3 or more Dunk-A-Treat Bonus symbols land on an active payline. In this game, the player is given a choice of 5 treats. The chosen treat reveals a bonus prize amount that is awarded to the player, and then the game returns to the regular slot machine.